Thank you for choosing School Site as your website solution! We are excited to launch your custom design project. Once you have submitted a General Agreement to our Sales Representative, you will receive an e-mail from your Content Coordinator as well as an invitation to Basecamp, an online tool we use to track progress, share ideas and communicate with you throughout the process. As you can imagine there are many steps involved in a custom design website project, but we will guide you throughout the process. For more information on Photography, see our photography guidelines. If you do not have professional logos for your organization, we do offer original logo creation design services, as well as logo updating / creating professional logo file services. Please contact us for more information. We will use a variety of other websites (School Site custom sites and other industry sites) to visually communicate ideals, examples, and features that you may be interested in. 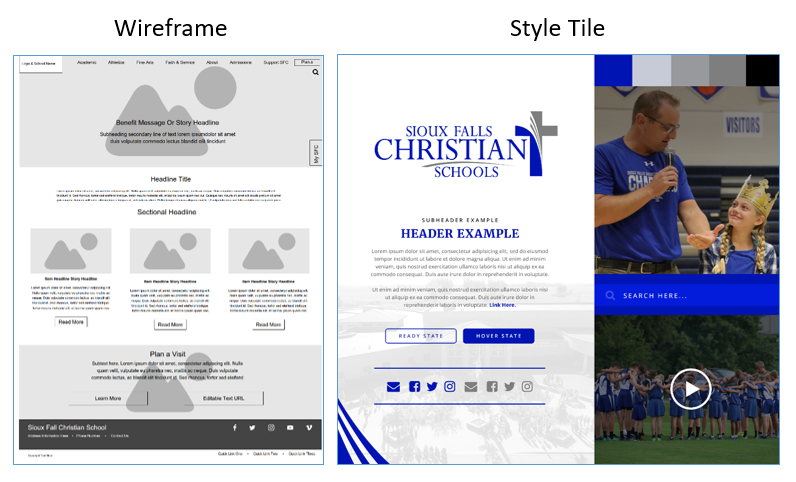 Layout options on the interior pages will be selected in the School Site Content Management System (CMS). Options include banner images, interior navigation menus, main content area tools, right side content area tools, headings, pages titles and more. If you are an existing School Site customer, we will work with you to decide on a wrap/conversion or old-to-new site process. Once we have received your full approval on the designs, we move the project into the Coding/Implementation/Testing phase. Depending on queue volume, this process typically takes 3 to 4 weeks. Your Content Coordinator will notify you as soon as an expect release date is established so that training can be scheduled. Your training will be conducted via WebEx with the School Site Specialist and your Content Coordinator. The Training Specialist will cover the basics of the Content Management System and provide you with your login credentials. Our support team is available to answer any additional questions you may have along the way. You may reach us by calling into Renweb Support or e-mailing schoolsitesupport@factsmgt.com. Once you have built the content on your new site, you can schedule your site to Go Live. Please click here to visit the Go-Live Resource Page.